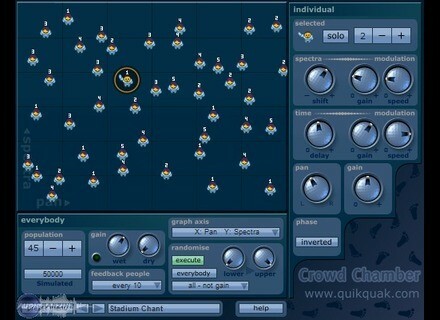 Crowd Chamber, Other Effect Plug-in from QuikQuak. 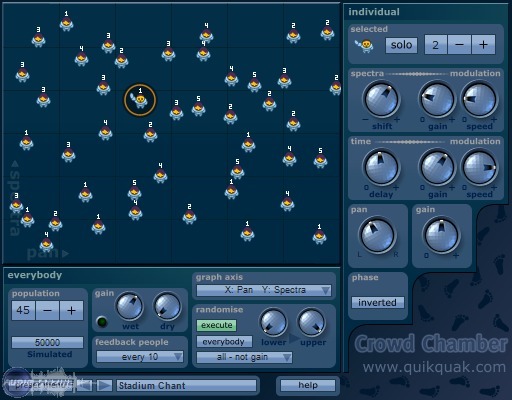 QuikQuak has released Crowd Chamber - an audio plug-in that layers multiple variations of a signal to create a crowd simulation. Accroding to QuikQuak, up to almost 2,000,000 layers can be produced enabling simple chorusing effects, small crowds and stadiums, on to impossible situations and effects. We're told that when each voice is mixed, it is altered in varying time and spectral content, making unique versions of itself to create the illusion of different sources. This effect can be fed back onto itself to create many thousands of voices in real-time. Priced at £15 Crowd Chamber is available for Windows and Mac OS X in VST and AU plug-in formats. Demo versions are available. Cluster Sound Tube Sequenz Cluster Sound Releases Tube Sequenz XPander Pack 04.